A radiant smile goes deeper than just aesthetics. Your smile has a profound effect on other aspects of your health, often in ways that may not seem apparent. When your smile is at its beautiful, healthy best, your entire body benefits — and when it isn’t, your health can suffer. To take the best possible care of your well-being, you should focus on these areas of your smile. One of the most obvious traits of your smile — and one that many people go to great lengths to attain — is the straightness of your teeth. Crooked, uneven teeth can be a major detriment to your appearance even if they seem otherwise healthy, while straight teeth are always desirable. That's one reason treatments such as Invisalign are so popular. But straight teeth offer more than cosmetic benefits. Teeth aren’t meant to work alone, and when one sticks up higher than others, it takes a disproportionate amount of force when you bite down. Additionally, when teeth are tilted, they are pushed against the sides of their socket instead of straight down into it, which can compromise the strength of their roots. Teeth are at their strongest when they stand straight and even in your mouth, and that strength protects them from wear, infection, and breakage. As you go about your day and as you sleep at night, plaque is constantly building on your teeth. This sticky, yellowish substance obscures the natural brightness of your tooth enamel — even more so when the plaque hardens to tartar. When plaque isn’t removed frequently by brushing and flossing, your teeth become dark, dull, and unappealing. Tartar also provides a foothold for more bacterial growth, which can lead to cavities, gum disease, and tooth loss. Keeping your teeth healthy means keeping them clean — and you’ll get the benefit of that bright white shine as well. Regular cleanings are one of the best ways to keep your teeth bright and healthy. When gum disease is allowed to develop too far, it can lead to tooth loss and other dental health problems. But even that serious outcome isn’t as dire as the likely effect on your health. Periodontal disease has been linked to a number of serious health conditions, from heart disease to arthritis to dementia. While the mechanisms aren’t yet understood, it’s clear that the same infections that produce red, bleeding, swollen gums also increases your risk for conditions which will affect the rest of your life. Besides predicting major diseases, missing teeth have another, more direct effect on your health: interfering with your diet. Healthy eating relies on the ability to consume a variety of foods, many of which are difficult to eat with missing or sore teeth. To maintain a varied diet, you should start with maintaining your teeth. The good news is, if you are eating healthy foods, especially those rich in minerals like fluoride, your teeth will be more likely to stay healthy along with the rest of your body. The relationship between teeth and nutrition always goes both ways. The look of your smile is a big component of identity and self-esteem. When you can’t smile without embarrassment, it can decrease your self-worth and damage your mood. When you’re proud of your smile, you’ll be more comfortable and more confident — a major plus for your dental health. This means even purely cosmetic dental procedures have a positive role for your health. 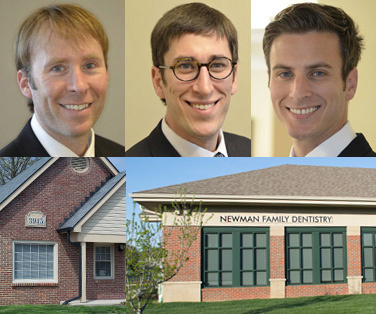 At Newman Family Dentistry, we want to help you maintain both your health and your looks, and we’re aware of the strong relationship between them. Contact us for cosmetic dentistry as well as for preventive procedures and disease treatment, and let us help you improve your life.